Super Rugby Team Crusaders Consider Name Change After Christchurch Shootings The Super Rugby team said Wednesday it would consider changing its name after shootings at two Christchurch mosques last month, as a result of its brand's association with religious war. 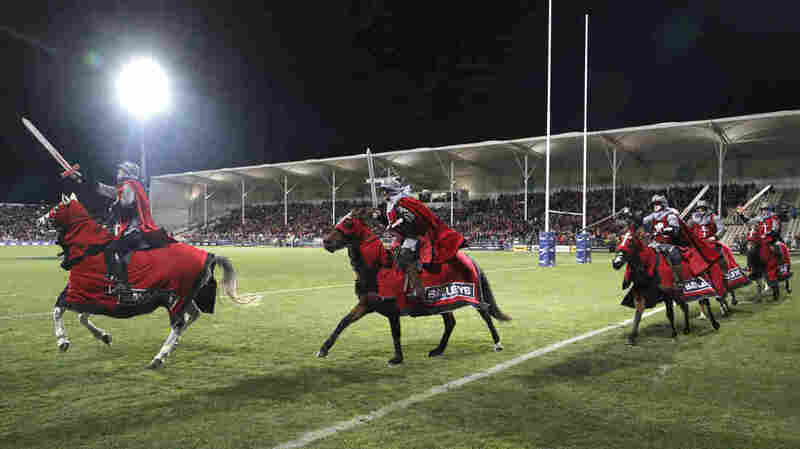 Pictured here in 2018, the Crusader horsemen ride around the arena before the start of a Super Rugby semifinal match. The Crusaders announced Wednesday that the team will be considering a change to its name and branding following the Christchurch attacks on March 15. The Crusaders rugby team will consider dropping its imagery of sword-bearing knights on horseback and changing its name, following last month's shootings at two mosques in Christchurch, New Zealand, in which 50 people were killed. The current branding of the Christchurch-based team is "no longer tenable" because of associations with religious war, New Zealand Rugby's chief executive, Steve Tew, said in a statement released Wednesday. He said "maintaining the status quo" of the name and imagery was not under consideration. Tew said it was clear that the Super Rugby franchise's symbolism was "offensive to some in the community due to its association with the religious Crusades between Christians and Muslims." The team says it will decide the extent of the rebranding — whether to overturn its brand completely or retire its imaging but keep the name — in consultation with an independent research company. The team will also halt its traditional prematch entertainment of knights riding horses, The Associated Press reports. Calls for Super Rugby's top franchise to consider changing its symbols have come from fans, community members, commentators and lawmakers in the weeks following the March 15 terrorist attacks that left dozens wounded and shocked the country. The team, along with others, opted to cancel a highly anticipated match that was scheduled for the following day out of respect for the victims. On the heels of the cancellation, Crusaders CEO Colin Mansbridge said the franchise would delay considering any branding changes until "an appropriate time." Several days after the shooting, the team was already undertaking discussions with the Muslim community in Christchurch, according to Grant Robertson, New Zealand's minister for sport and recreation. "I think that's appropriate, clearly this is a big issue in Canterbury," he was quoted as saying by New Zealand newspaper Stuff on March 19. "The Crusaders is a well-established name and brand, but I think it's a responsible action to undertake those conversations now." Some New Zealanders have resisted the change, in part because of how established the franchise is. On Wednesday, Mansbridge reiterated the defense of the brand that he had originally put forward just days after the shooting. "Our challenge is that the name Crusader has come to mean something quite different to many of the team's supporters," he said. "This team is proud of the positive contribution it makes to the community." Mansbridge said "tragic and trying events" had molded the team into a galvanizing force for the region, making the name "more reflective of a positive Crusade." Those sentiments were echoed online and in New Zealand media, with one radio DJ arguing the team played an important role for the Christchurch community following the 2011 earthquake that killed 185 people. Other people took issue with Tew's statement that an association with the religious Crusades "has now been drawn." "The link has not been 'drawn'... it has been actively promoted for years," tweeted Liam Dann, New Zealand Herald business editor-at-large. The Crusades were a series of religious wars between Christians and Muslims over territorial control of holy sites in the medieval period. According to the team, the Crusaders brand was modeled off "a stylised version of medieval England, in a nod to the English heritage of Christchurch," when the Super Rugby competition began in 1996. The team's website describes the horseman logo, recognizable "Conquest of Paradise" theme song and center-piece sword as "pieces of the Crusaders jigsaw have made the Crusaders concept widely recognised and so intimidating for visiting teams." The franchise's name and wardrobe will remain the same through the end of the 2019 season. The team has invited the public to offer feedback about the branding.